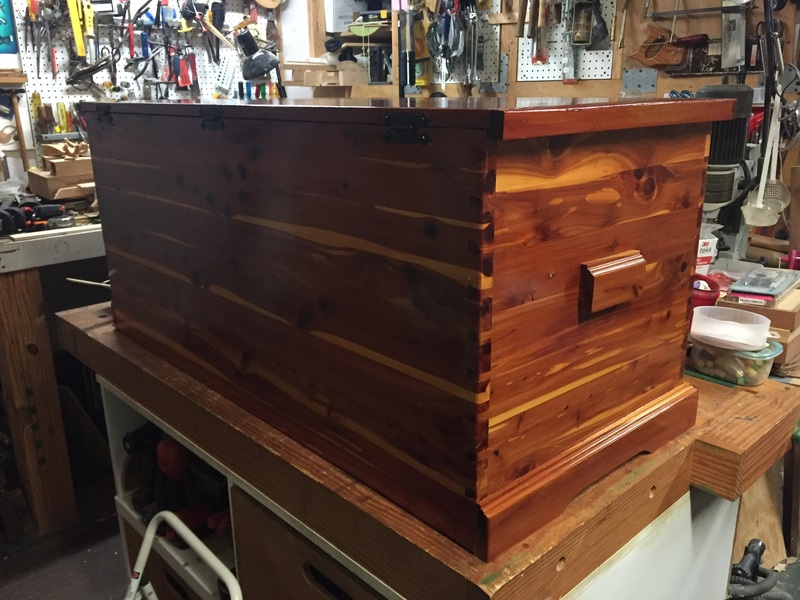 Occasionally we are asked to refinish and repair a project like this cedar chest. The top had split down the glue line and the bottom was cracked and split in several places due to too much load. We took the top off and re-glued all the joints as well as the edge trim. Next, we turned our attention to the bottom of the chest, installing a couple of “butterflies” to check the cracking and then used epoxy with cedar wood dust to close the open places. The hardest part was to identify the original finish, which turned out to be shellac, not varnish or any of the newer more common finishes. Nice thing about shellac is you can clean it (and thin it) with denatured alcohol and when you brush on the next coat of shellac it bonds to the old stuff “no questions asked” no matter how old the original finish – much better than having to strip and refinish a project.